BOSS Drives (Backwater Outdrive Systems and Solutions) is the newest mud motor on the market today. This motor combines the convenience of an outboard with the shallow water capabilities of a surface drive mud motor. BOSS drives shift gears on the tiller handle or console (F-N-R) just like an outboard. 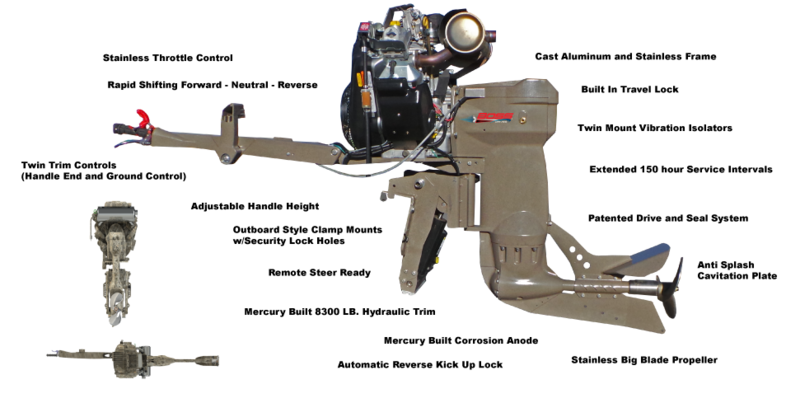 These motors also use a fast, reliable mercury trim unit and have a trim switch at the end of the tiller handle for on the fly adjustment without ever taking your hand off the handle. There is also a secondary trim switch for easy reach when needing to trim the motor out of the boat.